Chaining enables you to associate two or more related values. When you chain controls together, chained values are filtered as selections are made to each parameter control. For example, if you chain the PLANT parameter to the STATE parameter, only PLANT values for the currently selected STATE value will be available, instead of all the plants in the data source. Each time a selection is made, all chained controls that come after will be dynamically updated. Chaining also enables you to add, remove, and reverse the order of controls in the chain. Values are processed with a caching mechanism that gathers all of the necessary values, prior to loading the page. This method automatically combines all of the necessary requests into a single HTTP request and maps the result sets to the appropriate controls, greatly reducing the load time involved with sending multiple requests for data. Create an HTML page using input controls to supply parameter values. For details, see Using Input Controls to Supply Parameter Values. Select the center of the control object, left-click and drag the control to the center of the next control object in the chain. Release the mouse to complete the link. Repeat this step for each link in the chain. Tip: Optionally, you may use the Positioning toolbar to add and remove controls to a chain. Both chaining options (drag and drop and the chaining icons) work in conjunction with each other. If you create a chain by one method, you can remove the chain by using the other method, and vice versa. For more information about chaining icons, see Positioning Toolbar. The image below is an example of chained controls. Notice the direction of the arrows. The Region control starts the first link in the chain, chained to the State control. 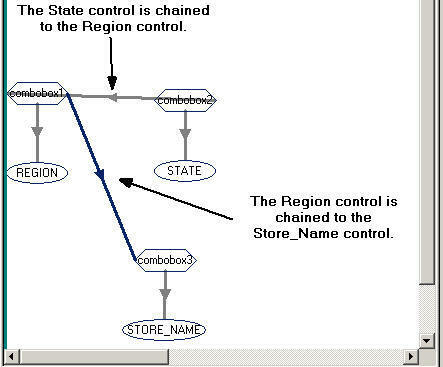 The State control starts the second link in the chain, and is being chained to the Store_Name control. Tip: You can also reverse the order of controls in the chain. For details, see How to Reverse the Order of Chained Controls. Optionally, apply condition settings to the chain to determine how parameters are populated. For details about conditions, see Applying Conditions to a Chain. Select the arrow head on the line so that the line is bold. Repeat this step for each link in the chain that you want to break. Select the arrow head on the line so that the line is bold, right-click and select Break binding. Select the center of the control object, left-click and drag the control to the center of the next control object in the chain, and release the mouse to complete the link. Notice the direction of the arrow between the control objects. You may reverse the direction of the link in the chain or reverse the order of the chain by changing the direction of each link. If reversing the direction of a link in the chain, click and drag the control object in the desired order. The Store_Name control starts the second link in the chain, also chained to the State control. 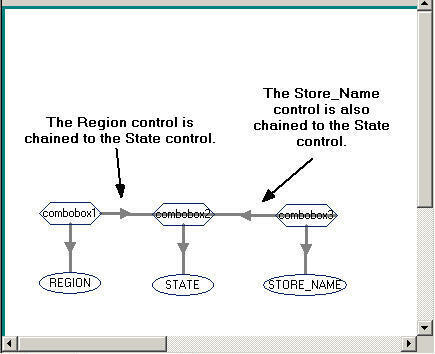 Note: Conditions are needed in order to make Region disappear from the chain, and to make Store_Name control State. For details about conditions, see Applying Conditions to a Chain. If reversing the order of a chain, click and drag the control objects in the desired order. Tip: In some scenarios, when reversing the order of chained values, you may want to move the controls from the default location on the Parameters tab so that you can better see the direction of the chain. Moving objects on the Parameters tab will not affect the Design view of your layout. Press the Shift key and select the control object and bound parameter to move the objects as a set. Chain the control objects together. For example, in the following image, the State control starts the first link in the chain, chained to the Region control. 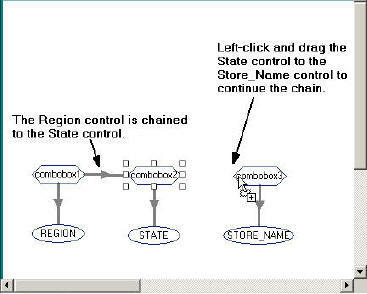 The Region control starts the second link in the chain, chained to the Store_Name control.